Taste test: These crisp, wide-rippled chips were quite tasty and were enjoyed by all who tried them. For those unaccustomed, the flavor is buffalo (the animal), not Buffalo (the city in upstate New York) wing. There wasn't a whole lot of salt that I could taste, but the flavor still came through quite strongly. Apparently, this Balance recipe is quite healthy, but even if you ignore that and focus solely on taste (as you should! 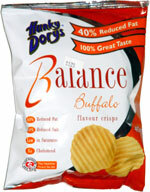 ), these were great chips. Smell test: Very tangy, made my mouth water.